Saul Walter Rogovin (October 10, 1923 – January 23, 1995) was a professional baseball player. 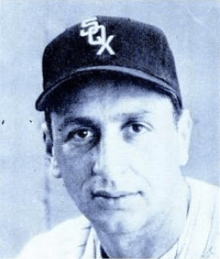 Rogovin was a pitcher over parts of 8 seasons (1949–57), with the Detroit Tigers, Chicago White Sox, Baltimore Orioles, and Philadelphia Phillies. For his major league career, he compiled a 48–48 record in 150 appearances, with a 4.06 ERA, 10 shutouts, and 388 strikeouts. Rogovin played infielder at Abraham Lincoln High School. He tried out for the Dodgers, but was not signed. Rogovin played Class D ball in Beaver Falls, Pennsylvania. Umpire Dolly Stark saw Rogovin play for a corporate team in 1941 and got him a tryout with the Giants. He played for a short time with their affiliate in Jersey City before his contract was sold to Chattanooga. It was their coach, Red Lucas, who put Rogovin in as a pitcher. He pitched a shutout game against the Birmingham Barons to close the 1945 season. He spent a short time with teams in Pensacola and Buffalo. Before the 1944 season, Rogovin signed as a free agent with the Washington Senators. Prior to the start of the 1947 season, he was sent by the Senators to the Detroit Tigers. During spring training, he began to experience some soreness in his pitching arm. That year Rogovin was 2–1 with a 4.50 ERA while pitching in 11 games. Rogovin hit a grand slam in 1950 off Eddie Lopat of the NY Yankees. The next grand slam by a Jewish pitcher was not hit until Jason Marquis hit one in 2008. On May 15, 1951, he was traded by the Tigers to the Chicago White Sox for Bob Cain. He led the American League with a 2.78 ERA in 1951 while playing for Detroit and Chicago. He was 4th in the league in hits allowed per 9 IP (7.85), and 5th in complete games (17) and shutouts (3). He had 12 wins and eight losses that year, with seven losses by one run and one by two runs. In 1952 he struck out 14 Red Sox players in a 15-inning game. He was 7th in the league in innings (231.7; a career high), 8th in shutouts (3), 9th in games started (30) and wins, and 10th in strikeouts (121). On December 10, 1953, he was traded by the White Sox with Rocky Krsnich and Connie Ryan to the Cincinnati Reds for Willard Marshall. In December 1954 he was sent from the Cincinnati Redlegs to the Baltimore Orioles. On July 9, 1955, he was released by the Orioles and signed as a free agent with the Philadelphia Phillies, where he had an ERA of 3.08 and a 5–3 win-loss record. Through 2010, he was 10th all-time in career wins (directly behind Larry Sherry) among Jewish major league baseball players. Rogovin obtained his teaching certificate after leaving baseball and taught school in New York City. 1 2 "Saul Rogovin Statistics". The Baseball Cube. Retrieved May 30, 2007. ↑ Ribalow, Harold. "Jewish Baseball Stars: Saul Ribalow, Power Pitcher". Retrieved May 30, 2007. ↑ "Plenty of highlights for Jewish Major Leaguers in '08". New Jersey Jewish News. October 9, 2008. Retrieved May 22, 2009. ↑ Carrie Muskat. "Marquis simply grand in win over Mets". Chicago.cubs.mlb.com. Retrieved February 1, 2011. 1 2 "Saul Rogovin Statistics". Sports Reference, Inc. Retrieved May 30, 2007. 1 2 3 "Jewish Sports Hall of Fame: Saul Rogovin". Suffolk Y JCC. Retrieved February 24, 2014. ↑ "Career Pitching Leaders". Career Leaders. Jewish Major Leaguers. Retrieved February 10, 2011.